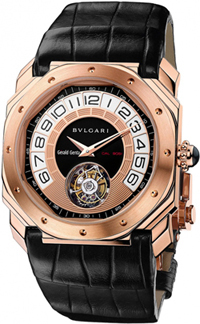 Bvlgari announces the release of new items Octo Tourbillon Retro. The legendary company Bvlgari extend its novelty collection, called Octo Tourbillon Retro. The legendary company Bvlgari extend its novelty collection, called Octo Tourbillon Retro. The model 43 mm case is made of 18-carat rose gold. The dial is also made of white gold with lattice trim. At the top of the dial are Arabic numerals, of which the “6” is repeated twice. The clock is performed by a central retrograde hands in pink gold with 240-degree scale. Jumping Arrows performed every six hours. The minutes are due to a central golden arrow that skeletonirovana. In the lower part of the dial, the label “6:00” placed a delightful tourbillon, giving hours of incomparable appearance. Protects dial sapphire crystal. New Octo Tourbillon Retro GG9051 automatic caliber equipped with a 64-hour power reserve. Model comes on a black alligator strap with a buckle in 18-carat pink gold. Buy watches Octo Tourbillon Retro from famous brand Bvlgari possible for 90,000 euros.